Raywood is a small rural township on the Bendigo to Swan Hill railway line, 27 km north of Bendigo. It was the most northerly of the gold fields in the Bendigo-Whipstick forest area, and is in mainly flat, open country. The source of Raywood’s name is a matter of divided opinion. It is agreed that a miner from the Sebastian diggings found alluvial gold at Raywood (then called Thunder Plains) in 1863. James Flett’s definitive history of gold discovery states that the miner’s name was Raywood. A later authority, William Perry, states that the finder was Joseph Woodward whose hometown was Raywood. There is no Raywood village or town in recent standard English gazetteers, however. Quartz reefs were found in 1864, the most productive being the Nil Desperandum which was worked until 1889 and again from 1906 and 1917. Within a few months of the 1864 discoveries there were numerous stores and hotels established at Raywood. 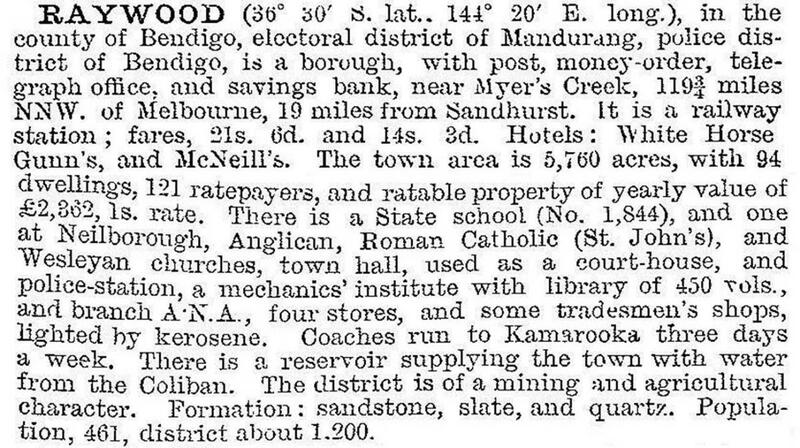 Bailliere’s Victorian gazetteer for 1865 recorded a post office (January 1864), seven hotels, a bank branch, a population of over 1500, quartz crushing mills and puddling mills. On 3 January 1865, Raywood was proclaimed a borough, extending to Neilborough. A Catholic school was opened in 1864. The decline of mining after 1900 was accompanied by a decline in the borough’s population. Neilborough’s population had also declined since the turn of the century. On 1 October 1915, Raywood borough was united with Marong shire. After World War I a soldiers’ memorial hall was built. The district’s farming was mainly sheep grazing and cereals, and a silo was built at the railway siding in 1941. Notwithstanding Raywood’s slow decline from mining riches to more mundane agriculture, its name is preserved as the birthplace of two notable Australians. Hugh Victor McKay (1865-1926) was born at Raywood. At age 18 McKay was inspired to build a combine stripper-harvester at his parents’ farm at Drummartin. It was the forerunner of his Sunshine Harvester works. John Donaldson (1886-1933), also born at Raywood, was a world champion sprinter. After winning races at Bendigo in 1906 he went on to beat Olympic and International title-holders. His world times for the 100 and 130 yards sprints were unbeaten until 1948 and 1951 respectively. He was known as the Blue Streak. Raywood has become a minor district centre as the villages of Neilborough and Summerfield have lost their few facilities. Raywood has a hotel, general store, butcher, motor garage, recreation reserve, a golf club, swimming pool (1959), Anglican, Catholic and Uniting churches, a memorial hall and a school (53 pupils, 1998 and 33 pupils, 2014). The long awaited 23 km Sebastian-Raywood pipeline (2010-13) delivered a secure water supply to the town residents. At the 2011 census, farming accounted for 22.6% of employment.